cheery and upbeat manner and bearing render it difficult to comprehend that she spends her working days dealing compassionately with some of the most physically distressed people in the Comox Valley community. 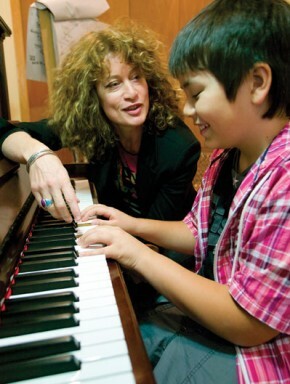 Piano teacher Kelly Thomas takes a unique approach to helping students like Zak Watson learn. her silver bracelets quietly chime together. And as she excitedly discusses the power of music and the inspiration she finds in sharing her musical passions with her students, ampoule her wrist symphony rises to a crescendo. Nestled into a First Street green space, Thomas’ home and studio look out onto a small creek and the wildlife that use the space as a corridor to the Puntledge River. Thomas moved to the Valley from Edmonton two years ago and started teaching piano and salsa dancing. She had 25 years of experience as an accompanist but had only taught art—never piano—before this. “The traditional piano methods that I had learned with didn’t even remotely convey the feeling I had about music and where the joy, for me, is,” Thomas explains. This joy comes in giving her students music as a lifelong companion and empowering them to find their own individual voice through music. She accomplishes this by using a non-traditional, or playing-based, method of teaching called Simply Music. Simply Music was developed by an Australian musician, Neil Moore, who was given the challenge to teach a blind, eight-year-old boy to play the piano. So, Moore began to compose pieces and ‘distill’ them into patterns that he could translate directly into his student’s hands, and thus onto the keyboard. It sounds complicated but it is as natural as learning how to speak. Not only did Moore’s student excel through this method of teaching, he was able to pass on these lessons to his four-year-old sister, who was also blind. Moore began to share these techniques with other teachers and Simply Music was born. This deep connection with a musical community is what Thomas has found in her own life, whether playing in a band or accompanying others. Thomas met her lifelong friend, the piano, at the age of seven with reading based lessons starting in Calgary and eventually in Yellowknife. She played both popular and conservatory pieces but didn’t participate in any of the exams until university where she went straight into the Grade 9 exam and came out with first class honors. Arriving in Edmonton, after growing up in Yellowknife, Thomas initially enrolled in the University of Alberta’s music program, but later switched to another highly successful music program offered by Grant MacEwan Community College. There she developed her music skills in the jazz program and cultivated her interest in a broad range of music. To make ends meet while at school, Thomas hosted a classical music show on Alberta’s CKUA radio station. CKUA is a listener-funded radio station “with a tremendously broad range of programming in classical, jazz, folk, rock, world, alternative as well as educational segments”—a perfect fit for someone with Thomas’ background and predilections. It was about this time that Thomas reconnected with another great love in her life: Cuban music. A Nigerian with a cockney accent and a PhD in genetics had started teaching Cuban salsa and it caught on like wildfire. “It is a hugely popular dance that is taking the whole world by storm,” Thomas says. “And, one of the best things about it is that you can go almost anywhere in the world and find a place to dance salsa. Thomas’ shift from participant in music to teacher coincides with her move to the Comox Valley. Her commitment to contributing to the musical community is evident in her other endeavours: pianist with the Georgia Straight Big Band and flautist with the Comox Valley Concert Band. In their first couple of lessons, Thomas taught Rogers some basic movements on the piano and some terminology. By the third lesson, Rogers was learning the blues form and in the first year she learned a number of well known classical pieces, accompaniment, major, minor, seventh and thirteenth cords, some popular pieces, and a number of pieces that she wanted to learn that weren’t part of the core curriculum. piano instructor Kelly Thomas is musical. As she talks about how music has shaped and guided her life, her silver bracelets quietly chime together. And as she excitedly discusses the power of music and the inspiration she finds in sharing her musical passions with her students, her wrist symphony rises to a crescendo. is about ‘giving’ and blessedly the people of the Comox Valley are mighty generous in caring for the wants and needs of the less fortunate among us. Since its beginning in London’s East End, two years before Canadian Confederation, the Salvation Army has become a worldwide non-government provider of social services. The Canadian Salvation Army began in 1882, and the pastoral mission came to the Comox Valley in 1964. That is in itself a tall order in that the ‘Sally Ann’, as it is popularly referred to and not impolitely, has many irons in the fire of giving to the public. The homeless shelter on Pidcock Avenue (Salvation Army supported and operated, with assistance from BC Housing) is in huge demand in these economically perilous days, and the Family Services Centre is also meeting major challenges in caring for the wants and needs of the dispossessed. The challenge always, Burry says, is to treat people in need with dignity and respect, regardless of how they ended up in a position of want. Some end up in homeless poverty due to job loss, family illness or other misfortune. Others lose it all due to abuse of drugs or alcohol. None of those circumstances matter to the Salvation Army in terms of giving assistance, Burry stresses. The Salvation Army’s philosophy in terms of giving is that they strive to give a “hand up” rather than a “hand out,” Burry says. That philosophy goes back to Salvation Army founder William Booth, who believed that despite the fact the organization is a Christian mission, the first thing a person needs in getting that hand up is his or her physical health. Back to the kettle campaign. This year’s goal for the Comox Valley is to raise $70,000, Burry says. He adds that all funds raised in this community stay within this community. Does the $70,000 get the job done? Not really, Burry says. Last year the shelter cost more than $100,000 just in food products, so there is obviously a gap in revenue. This year the kettles will be in eight locations in the community. The campaign itself began on November 20, and beginning in the first week of December, the drive runs six days a week. Local kettle sites are Wal-Mart, Superstore, Safeway, Canadian Tire, Quality Foods and the three government liquor stores. The liquor store locations are especially fruitful, Burry adds. Although the majority of the kettle minders are volunteers, Burry says it is necessary for the Salvation Army to hire some paid staff to cover all the hours demanded, which works out to 1,600 hours. The work is all in the capable hands of staff member Dawn, he says, who coordinates the kettles, the teams and the schedule of shifts, and so forth. A demanding chore. 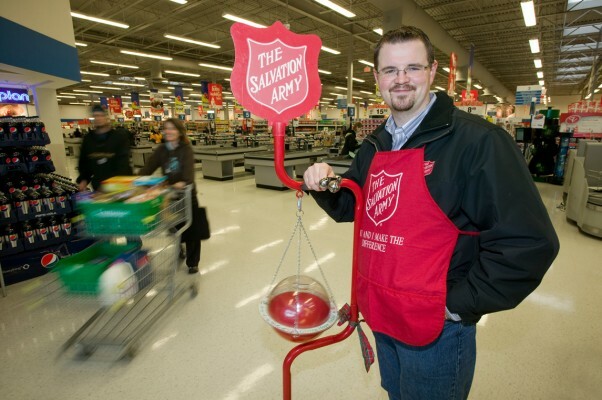 While the kettle campaign is a vital fundraiser for the Salvation Army, much of the essential revenue emanates from the familiar thrift stores in Courtenay and Comox. The Salvation Army’s philosophy in terms of giving is that they strive to give a “hand up” rather than a “hand out,” says Darryl Burry, lead pastor of the Comox Valley Missions. The Sally Ann kettles can be found at eight locations throughout the Valley this holiday season, including SuperStore. Arguably of all the symbols that mark the advent of the Christmas season, few are more ubiquitous than the Salvation Army kettle. And why not? Christmas, in its true meaning, is about ‘giving’ and blessedly the people of the Comox Valley are mighty generous in caring for the wants and needs of the less fortunate among us.